As researchers and some of us noticed the best predictor of success are our past behavior which can be in some instance measured by employees’ reputation. This is one of the reason why 360 Degree feedback are so loved by consulting firms and their clients. Those evaluations are based on the perceptions of other about one’s behavior at work. 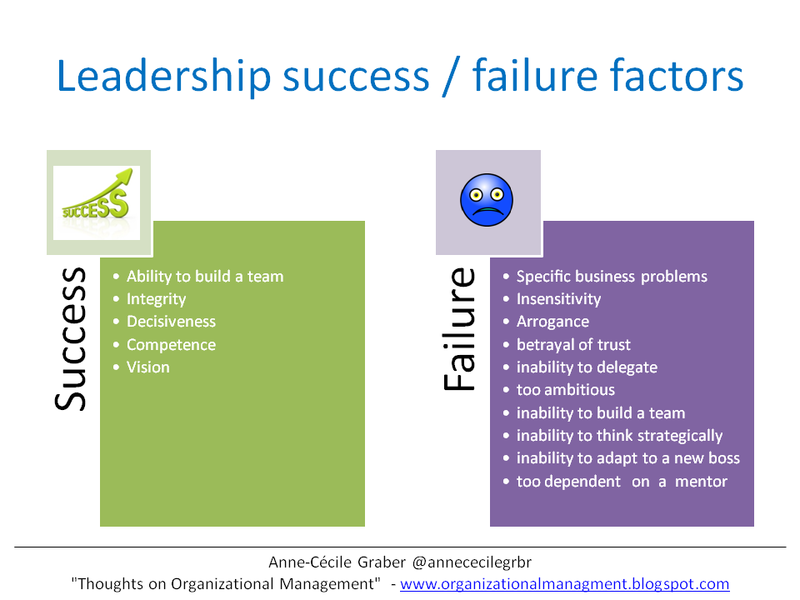 What about employee personality and more precisely the one who are suppose to lead teams – the managers? In the research field, big debates and research are led in order to shed a light on the importance of Personality on one’s success and its repercussion on the organization success or failure. One very important framework to study personality is the Five-Factor Model developed by Wiggins. As Robert Hogan and Timothy Judge explained it in Personality and Leadership “We use reputation to predict what people will do; we use identity to explain why they do it”. Understanding the reason why someone will do “what” he does helps build a coaching practices as well as develop empirical research. People personality can be explained as the tendency to express our bright or dark side. Our bright side manifest itself when we are handling ourselves well whereas our dark side shows its face when we stop “monitoring”ourselves. Every individual expresses a mix of bright and dark side which can then be identified as specific behaviors by external actors. This framework should be seen as a continuum more as a didactic explanation of personality. We evolve between our dark and bright side as on a continuum. Those tendencies express themselves at different times and in different situations. It seems important to add that an excess of a bright side may become a dark side and a dark side can also become a bright side. Our aim as managers or as consultants is to better understand how those different sides influence our behavior and how we can benefit from them. It is also useful to use this knowledge when trying to improve our managing practices. Robert Hogan and Timothy Judge defines good leadership as the capacity to “create and maintain a team, group or organization”. The personality of a leader and his actions impact his relationship with the people he works directly with. 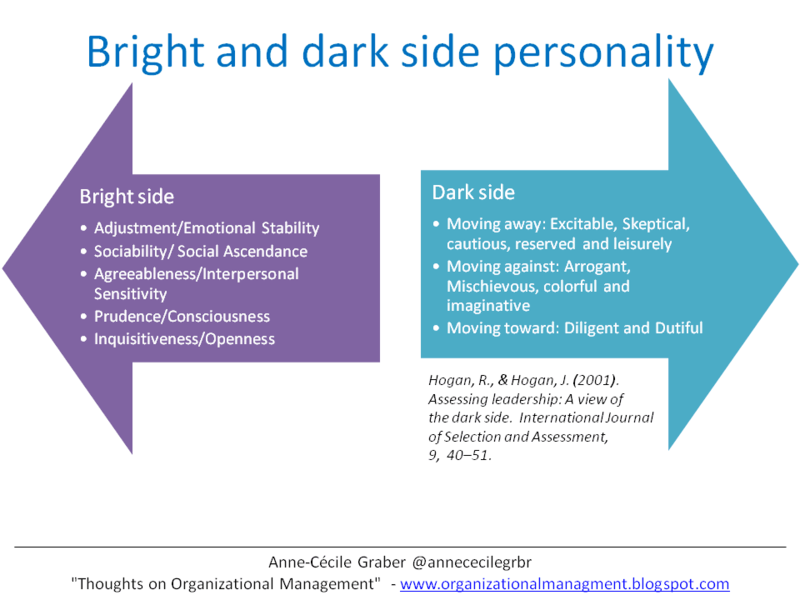 It is then important to identify success factors in leadership which can be linked to bright and dark side personality. Research shows that Managers are successful leaders when they can adjust and are emotionally stable. On the other side, sensitivity has a negative effect on leadership success. McCall and Lombardo (1983) studied derailed management and found ten reasons for their failure:” (a) speciﬁc business problems; (b) insensitivity; (c) arrogance; (d) betrayal of trust; (e) inability to delegate; (f) too ambitious; (g) inability to build a team; (h); inability to think strategically; (i) inability to adapt to a new boss; and (j) too dependent on a mentor.” some features are directly linked to dark side personality. A research by Kaplan, Klebanov, and Sorenson (2008) found out that the most important factors in leadership effectiveness are : integrity, decisiveness, competence and vision. The way employees view their superior influence the way they work. Employees have higher level of job satisfaction when they work with a leader that shows positive bright and dark sides personality. It is then important to keep those information in mind when determining the type of managers you want to select in your organization. Hogan, R., & Hogan, J. (2001). Assessing leadership: A view of the dark side. International Journal of Selection and Assessment, 9, 40–51. Hogan, R., & Judge, T. (2012). Personality and leadership. Unpublished manuscript. Kaplan, S. N., Klebanov, M. M., & Sorenson, M. (2008). Which CEO characteristics and abilities matter? Paper presented at Swedish Institute for Financial Research Conference on the Economics of the Private Equity Market, New Orleans, LA. McCall, M. W., Jr. ,& Lombardo, M. M. (1983). Oﬀ the track: Why and how successful executives get derailed (Tech. Rep. No. 21). Greensboro, NC: Center for Creative Leadership. Wiggins, J. S. (Ed.). (1996). The ﬁve-factor model of personality. New York: Guilford.